Well, friends, this was a fantastic month of books. I read a brilliant range of memoirs and novels, and I’m so excited to share them with you. Between school winding down and listening to audiobooks while I run or drive, I’ve been carving out time and space for reading lately, and I hope to have even more time over the summer, as my to-read pile is ever-growing. Let’s jump in to my May reads. As usual, I recommend them all to varying degrees. I’ve connected on social media with Anna LeBaron through several book launch teams, and I recognized her last name as polygamist because I’ve lived in Utah, where it’s notorious. So I’m not sure what took me so long to read this amazing woman’s memoir! I listened to the audiobook, and to hear her story in her own beautiful, genuine voice was an incredible experience. She does such a beautiful job of detailing the redemption in her difficult journey, and I’m grateful I read this book. The insider perspective from someone who grew up in polygamy was eye-opening and challenging. I read this book alongside my honors freshmen. I had seen the movie many years ago but this was my first encounter with the book–and what an encounter it is. This Holocaust story is beautiful and devastating. And the narration is magnificent; the style resonated with me and haunted me. This book is a brilliant must-read. My freshmen read this book as well, and it was interesting for me to read To Kill a Mockingbird and The Book Thief simultaneously. Both of them depict the underdogs, the solitary ones standing up against an evil ideology, even when no one but their own family stands beside them. Now that Scout’s story is fresh on my mind, Go Set a Watchman is on my summer reading list. I’m looking forward to experiencing that book for myself. Guys, I love everything Lauren Graham has ever done, and this book is no exception. I love her as Lorelai Gilmore in Gilmore Girls. I love her as Sarah Braverman in Parenthood. I love her memoir, Talking as Fast as I Can. I love the clips of her singing in Guys and Dolls on Broadway that I searched for on Youtube after reading Talking as Fast as I Can. I follow her on Twitter. I love this woman so much that it only made sense to read her debut novel, too. Hearing her read the audiobook was sweet–I find her voice soothing, and she adds to her characters in a way that enhances the experience. The novel isn’t earth-shattering, capital-L Literature, but it’s believable and structured in an interesting way and it’s a sweet, fun story about an actress trying to make it in New York. It was a perfect light read for my long runs. And did I mention I love Lauren Graham? I picked this book up at Half Price Books because I liked the cover, and because it’s a book about running and writing, two topics I love. 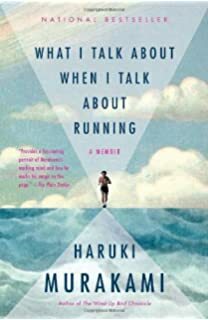 In his memoir, which was originally written in Japanese and translated to English, Murakami rambles in an endearing way about his runs, his writing process, sometimes just his day. Sometimes he has astute observations to share about discipline or the beauty of his passions. I read this book nightly as I fell asleep, and it was a soothing, philosophical gem. This four-act play was written in the 1950s about the Salem Witch Trials with the intention of drawing parallels between witch hunts and the Red Scare. Isn’t that SO FUN?! I think this was the majority of my juniors’ favorite literature from American Literature. It’s wild, dramatic, frustrating, and intense. It was another book I hadn’t read since I skimmed it in high school, so I enjoyed delving deeper. This book was a recommendation from an English department meeting. It’s a first-person narration by a young boy in England who has autism. I loved the way the author captured his voice so uniquely and offered entirely reasonable explanations for the sometimes-confusing actions of a child with autism. It’s endearing and charming and gripping and a little heart-wrenching. After I bought Murakami’s running book, I actually drove back to Half-Price Books because I saw this book on a display and couldn’t stop thinking about the subtitle: “Crafting a Handmade Faith in a Mass-Market World.” I love the concept of returning from industrialism to smaller, more human, more personal business interactions, like buying real food from farmer’s markets where your money changes hands with the person who grew it instead of self-checking out of a grocery store with a cart full of anonymous, identical products. I know that not everyone has the access or the means to buy artisan-made food or beverages, but I think that everyone should (and so do many wonderful organizations that are supplying good, whole food to food deserts). I think this month touched on some of my favorite topics: Holocaust writings, memoirs, sustainable food practices, running, and the classics. I’m not sure how June will top it, but I’ll sure try!